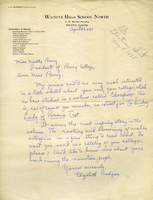 Elizabeth informs Martha Berry that she and her juniors (in high school) are very intrigued by the college. They read about the school in a book and are requesting a catalog to learn more about it. 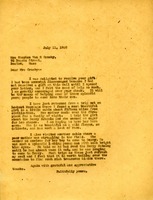 Martha Berry is delighted and much encouraged to receive a check from Mrs. Crosby. She indicates she has just returned from a trip to Lookout Mountain where she found a most beautiful girl in a cabin about fifteen miles from civilization. She notes she is one of a family of eight. She told her about the Berry Schools, and she seems eager for her chance. She describes her as beautiful as a wild flower, so delicate. 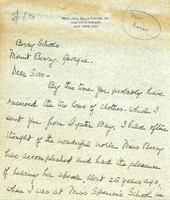 Martha Berry also met a young boy who is anxious to come to Berry. He told her he had read the Berry Catalog until he had almost worn it out. She states these trips refresh her. soul.